The Craft Year 2020 count down begins! Craft Year is a year-long celebration of contemporary fine craft, and we’re inviting YOU to celebrate along with us! This special project is led by the CCF/FCMA in partnership with all of the Provincial and Territorial Crafts Councils and our Affiliate Members across the nation. Craft Year is a platform to highlight Canadian craft activity at the local, regional, national and international levels. This is a wonderful opportunity to create special craft related events and activities that invite the public to experience craft through exhibitions, workshops, festivals, artist lectures, educational programming – any event that encourages public engagement or showcases craft in all its forms. We also encourage you to think outside of the box and bring contemporary fine craft to new audiences. Connect with the healthcare, education, business, social and cultural communities in your region to see where you could partner to highlight craft. In the first installation of Craft Year in 2007, we thought we might reach 50 to 100 events across the country throughout the year. By years end, 712 events had been registered, deeming Craft Year 2007 an international blockbuster hit. In 2015, the second instalment of Craft Year reached 884 events – an increase of 19.5%. Find out more about what events took place and where, as well as the online Craft Year experience, in our Craft Year 2015 infographic here. Planning something for Craft Year? Let us know! Want to start promoting your organization’s events even BEFORE 2020? Visit citizensofcraft.ca, create a profile for your organization, and publish your Craft Year 2020 event to our craft directory. If you are a member of a Provincial or Territorial Craft Council, create an artist profile to get your work on the site today. 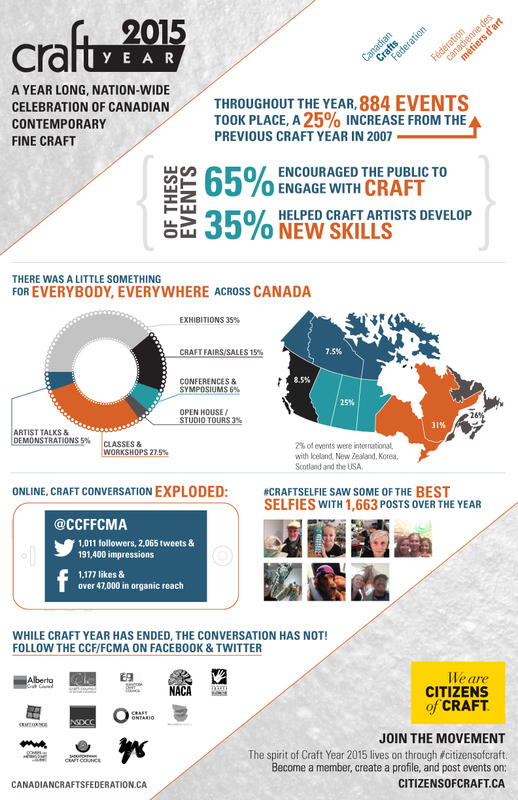 Want to stay up-to-date on Craft Year and other CCF/FCMA activities? Please sign-up for our bi-weekly newsletter!